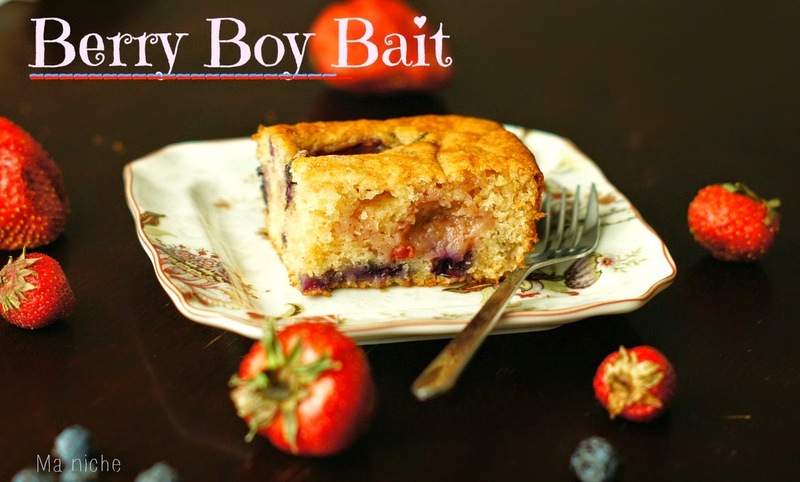 So it is not surprising that in 1954, a 15 year old made a buttery blueberry coffee cake and seeing the effect it had on boys, named it Blueberry Boy Bait. The cake recipe that Renny Powell from Chicago had submitted a recipe to the Pillsbury $100,000 Recipe and Baking Contest, only won her second place in the youth division that year, but it has stood the test of time and has been in circulation ever since. Even my husband who is a "strictly chocolate cake man" asked for a second piece. Elated by his response I made the same cake the following day for our friends and they too loved it. So yes. This recipe is definitely a keeper and with all the berries, it will fit right into your July 4th-tablescape. Center the rack and heat the oven to 350°F. Line the base of a 8×8 inch baking pan with a parchment paper, then grease the parchment paper and the walls of the pan. Sift the 1 cup of flour, baking powder, baking soda and salt into a bowl and keep aside. Bring the milk to a boil. When the milk begins to overflow, switch off the heat and set aside. Put the butter, applesauce and sugars in a mixing bowl. Using a hand-mixer beat the butter along with the applesauce and sugar until the mixture is creamy. Add 2 tablespoons of hot milk to the mixture and beat for a couple of minutes. At this point the mixture will look somewhat curdled and that is okay. Using a wooden spoon or rubber spatula, stir half of the flour into the butter-sugar mixture until it is just incorporated. Do not over-mix. Now add half of the remaining hot milk, followed by the remaining flour-mixture and then the the remaining milk. Mix all the ingredients with a light hand. 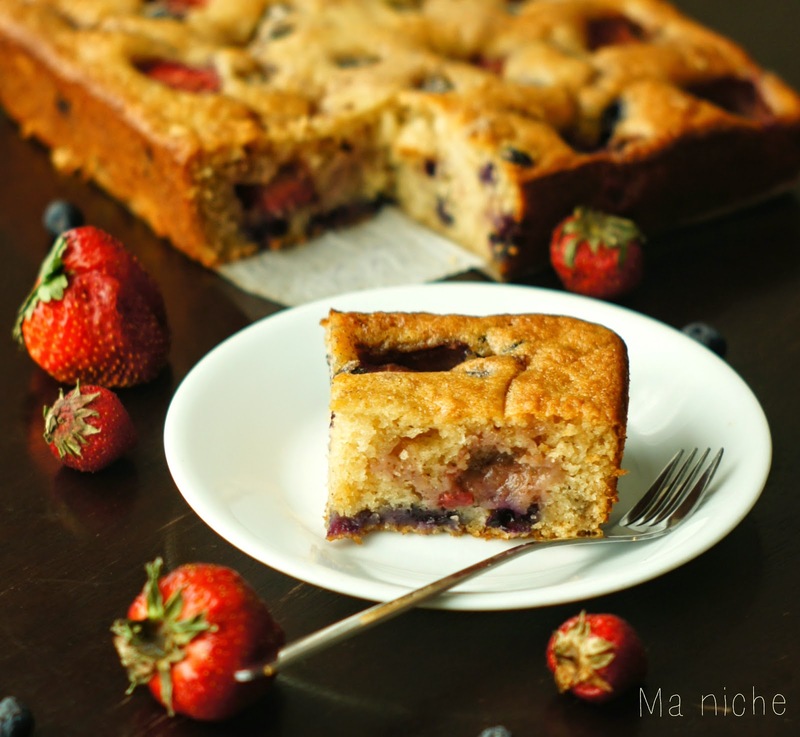 Toss the blueberries in ½ teaspoon of flour and scatter it over the batter. Then pour in the remaining batter over the layer of blueberries. Mix the ground candied citrus peel, 1½ tablespoon of granulated sugar, ground cinnamon and ½ of all-purpose flour in a small bowl. Toss the strawberries and blueberries in the mixture, half the strawberries and arrange the blueberries and strawberries (cut side up) on top of the batter. Sprinkle the remaining sugar-flour mixture over the open halves of the strawberries. Bake the cake for 32-37 minutes, until a toothpick inserted in the center comes out clean. Cool the cake in the pan for 25-30 minutes, then turn out and place on the serving platter. looks lovely and love the idea of mixing the berries. This looks yummy! I would love it if you joined and contribute your awesome posts at my link party at City of Creative Dreams, starts on Fridays :D Hope to see you there at City of Creative Dreams Link Party. Delicious Love that your prince picking berries. very cute. thanks for sharing with Hearth and soul blog hop.